Min Tong Siberian Ginseng (Eleuthero) granule extract is made from the world’s best naturally gown variety from northeast China. Each pack contains 1.5 gram of concentrated Siberian Ginseng through water extraction. 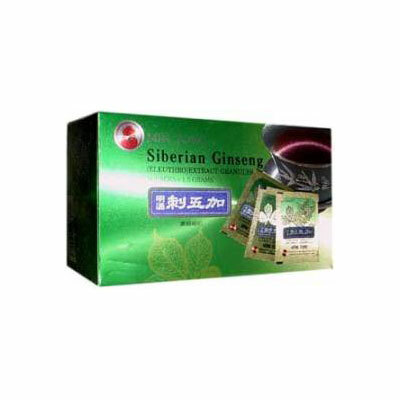 It is equal to taking the essence of 7.5 grams of dried Siberian Ginseng with its original flavor each time. No artificial chemical flavor added. Neurasthenia, insomnia, incubus, amnesia, fatigue, dizziness, poor appetite, migraine headaches, palpitations, depression. Impotence, impaired sexual desire, anxiety, inflammation. Dissolve 1 pack of Siberian Ginseng extract into 1 cup of water or juice, drinking 1 or 2 times a day as desired. Research in China has also suggested that this herb can be helpful in treating cancer. In addition, this herb prevented the spread of the sarcoma to other parts of the body. In China, the use of this herb, Ci Wu Jia, with cancer patients is preferable to the use of Ginseng.